At least 48 people have been killed after a coach plummeted 100m (330ft) down a cliff and landed upside down on a beach in Peru, officials say. The health ministry said six people had survived the accident, one of whom had jumped from the bus before it fell. The accident happened on a notorious stretch of road known as Curva del Diablo (devil's bend) in Pasamayo, north of the capital Lima. The coach, with more than 50 people on board, collided with a lorry. Transit police said the lorry driver had been detained for questioning. The bus, which belongs to the San Martín de Porres transport company, was travelling to Lima from Huacho, about 130km (80 miles) north of the capital. The stretch of road winding alongside the Pacific Ocean where the accident happened is considered one of the most dangerous in Peru. It has no barriers separating it from a sheer drop to the ocean and the sea spray and frequent fog can make it particularly slippery. The bus company that said its driver was very experienced and was travelling with an assistant. The company also said that the bus had passed a mechanical check before leaving Huacho. Footage showed rescue workers struggling to reach the bus, with a helicopter winching down some emergency workers while others were lowered down the cliff with ropes. Rescue work had to be halted overnight as the tide rose and engulfed parts of the coach. 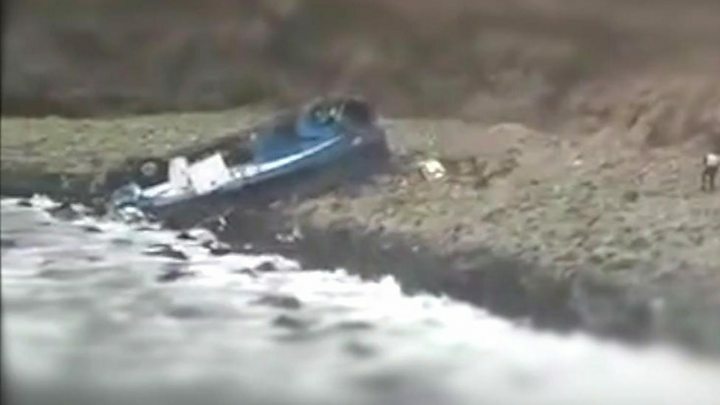 A Peruvian navy boat helped get the rescuers off the beach. Local media reported that one of the passengers managed to survive by jumping out of the coach before it plunged down the cliff. The doctor in the hospital where 24-year-old Máximo Jiménez Vilcayaure was being treated for a broken arm said the man had jumped out of a window with seconds to spare. Five other survivors were pulled from the wreckage and are being treated for multiple fractures. Twenty-four bodies have so far been recovered. Peru's President Pedro Pablo Kuczynski said it was "painful for the whole country to suffer an accident of this magnitude". He sent a message of "deep solidarity" to the families of the victims.